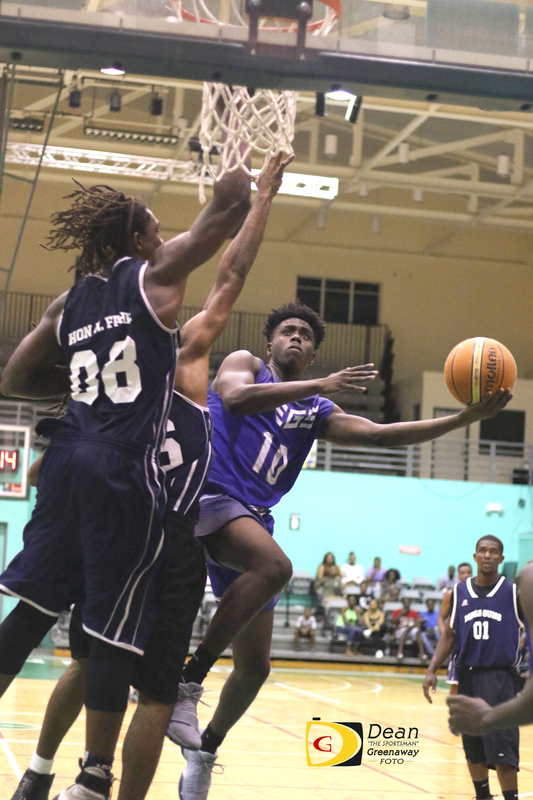 Even though he’s returning to the BVI Basketball Federation Sr. Division Championship Series that opens on Aug 9 with game one in the best of five, Legs coach Ronnie “Gola” Norman isn’t happy with the way their playoff series ended with Mega Mix. Saturday night’s playoff game scheduled to begin at 10:30 p.m., didn’t begin until 1:20 a.m. on Sunday morning. Diehard fans who stuck around for the game, left disappointed when Mega Guns forfeited the game with 3 minutes and 22 seconds left in the third quarter, trailing Legs, 76-51, after a call they didn’t like. Legs were leading the best of three playoff series 1-0, after Jason Edwin’s 23 points and 14 boards led six players in double figures, during Friday night’s 106-101 victory over Mega Guns. Norman was disappointed with what transpired. With the Virgin Gorda Mystics knocking Legs from the ranks of the unbeaten with a 102-83 victory, Norman, said he studied the Mystics and Go Hard’s game, learned several things and what he can fix when they meet in the best of five Sr. Division Championships Series which opens on Wednesday, Aug 9. .“I have an idea of how to beat them and will try that strategy and see what happens,” he said. For Legs, Jasin Rhymer Jr. had 19 points. Franklyn Penn Jr. followed up with 13. Jasin Edwin finished with 12, Kennedy Bass and Dione Blyden dropped in 11 each. Jevon Serrant and Douron Phillips were Mega Guns leading scorers with 16 and 13 points respectively. Killevn Samuel had 36 points and Steve Parillon added 26 points and nine rebounds in helping the Virgin Gorda Mystics eliminate Go Hard, using a 108-104 win. Stephon Caul who had 30 in the first game 102-94 victory, followed up with 13 points and seven rebounds. Go Hard’s D’Moi Hodge had a game high 38 and 11 boards, after an opening game 32 points 12 rebounds and 10 steals triple double. Deanglo Sampson added 16 points and seven rebounds to the tally, while Akeem Nibbs and Jachoy Walwyn followed up with 15 points respectively. Walwyn also finished with nine rebounds. In the Jr. division, K’Moi Walters had 15 points to lead four scores in double figures as defending champs And One swept the Virgin Gorda Jr. Mystics, 65-51, after a 90-69 Friday night triumph. Shadiim Rubaine added another 13 points. Dillion Ettiene finished with 11 and Ryan Richardson had 10. Demoi Bradley led the Jr. Mystics with a game high 16 points to go with seven rebounds and six steals. Stephano Paul and Elian O’Neal each poured in 10 points. Noel McKelly narrowly missed a double double with his game high 35 points and nine rebounds to go with six steals, but did not get the needed support as the Mavs fell to the Jr. East Rockers who advanced to face And One, 86-81. Antowan Robinson was Jr. East Rockers’ leading scorer with 21 points. Trent Herbert poured in 18 points and pulled down 12 boards, to go with four blocks and three steals. Ronald Antoine followed up with 17 points, six rebounds and four steals. For the Mavs, Lekhoy Hughes had a 13 point 12 rebounds double double and Kedrick Matthew also had 13 points and six steals.